Premier Auto Trade has announced the launch of the PlusQuip range of specialised tools and equipment. PlusQuip is a range of high quality workshop equipment suitable for the testing, repairing and replacing of automotive engine management and EFI components. 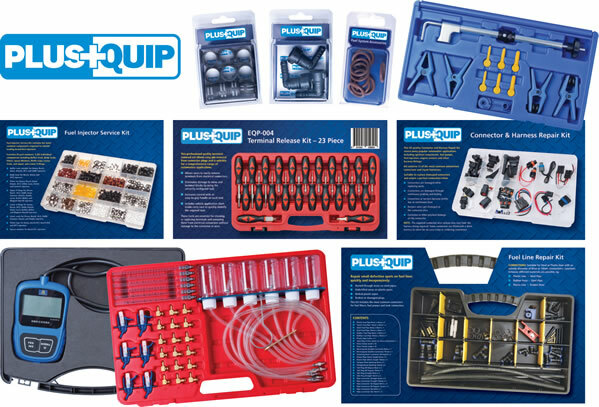 The PlusQuip range includes products for the professional technician involved in the diagnosis and service of engine management systems. The PlusQuip offering includes Fuel Injector and Fuel Line Repair kits, ODB11 Code Reader and Black Box recorder, Terminal Release and Test Lead sets, Fuel Pressure and Flow Test kits, Multimeter and Infrared Thermometer kit, Coil over plug and KV testers, and an Oxygen Sensor Tester. An ABS Wheel Speed Sensor tester that can reduce your ABS sensor diagnostic time to minutes is also included in the range. The common rail diesel injector return flow tester is a professional kit that is used to compare diesel fuel return on a common rail diesel system between each individual injector, and monitoring up to 6 injector flows during each test sequence. This Industry standard test requires the removal of the return flow pipes only (negating the potentially hazardous task of accessing the high pressure line) and fitting the specific test lines with adaptors to the injectors requiring testing. This can quickly determine if an injector is functioning correctly. This kit is suitable for many systems including Bosch, Denso, Delphi, and Siemens/VDO. A Relay Bypass Switch Master kit is also included in the range, allowing time saving troubleshooting of fuel pumps or any other automotive relay circuits. The Relay Bypass Switch plugs in place of the relay, and provides direct control over that circuit. The kit includes 6 switches for the most commonly used automotive relays and can be used to activate the fuel pump when the engine is not running (or headlight circuits, air conditioning or thermo fans and more), allowing the fuel pressure or other electrical circuits to be tested. If you are a technician involved in EFI and engine management then the PlusQuip product range is for you. PlusQuip is available through specialised automotive resellers and leading automotive retailers.